Leading convenience retailer Centra has teamed up with Carl Frampton’s award-winning and highly respected coach, Shane McGuigan, along with a top team of Ambassadors, to help inspire the people of Northern Ireland to Live Well Every Day. Centra’s ‘Live Well’ strategy, which forms an integral part of the brand’s new ‘Live Every Day’ campaign, launching today (Tuesday 17th January), represents an investment of £1 million and has been designed to address serious health issues in today’s society. The new Centra Live Well programme, which the Ambassadors are a key part of, aims to educate and inspire consumers to make healthier choices and encourage communities across Northern Ireland get active. McGuigan, the youngest son of former world boxing champion Barry, is a top signing to a roster of four Ambassadors spanning nutrition, fitness and mindfulness. The 28-year-old, who also coaches boxing stars David Haye, George Groves and up and coming talent Josh Taylor, will be creating a fitness plan and tips for Centra’s customers, housed on the Centra NI Facebook page. Joining McGuigan in the Centra ‘Live Well’ team, Centra Nutritionist, Jane McClenaghan will build on her work with the brand in 2016, designing a programme of healthy recipes and nutrition tips that will help people to make long-term positive lifestyle changes. Jane, who has a passion for good food and runs a busy nutrition clinic in Belfast, is committed to helping people avoid fad diets and making healthier choices every day. With mental health very much on the agenda, Bridgeen Rea is Centra’s Mindfulness Ambassador. Bridgeen is a qualified Mindfulness Meditation and yoga teacher and a wellness expert. She is the only person in Northern Ireland to have a Masters in Mindfulness Based Approaches and will design a 10-week course, which will guide people through key tips on how to manage busy lives and associated stress and anxiety, including the importance of a regular digital detox. Completing the four-strong team, two time Olympian and Commonwealth Games champion, Johnny Davis, has been revealed as Centra’s Run Together Ambassador. In 2016, Centra launched Run Together – a new running initiative that encourages people to get out and run in pairs, hosting a series of four events in Belfast, Antrim and Derry/Londonderry. The programme will expand in 2017, with running events coming to new locations in Tyrone and Fermanagh, driven forward under Johnny’s expert eye. Alongside the Ambassador programme, Centra customers will see real and effective change in-store with over 200 new healthy lines introduced across a number of key areas. These include Healthy Hydration, Healthy Snacking, Health & Wellbeing and Chilled Convenience. Speaking from Las Vegas, where he’s preparing Carl Frampton for his big World Title fight against Leo Santa Cruz, Shane McGuigan said: “I am very proud to be Centra’s Fitness Ambassador for 2017. For the next 12 months, we are going to work together to help get the people of Northern Ireland moving. “I started getting into fitness and nutrition when I was 13 years of age, when I started putting on a little bit of weight and started to get a little bit self-conscious and felt like I needed to do something about it. I took up running and boxing to get my weight down, and a long time after that, at 28 years of age – now 15 years later – I am in the fitness industry training the likes of Carl Frampton, George Groves, David Haye, Josh Taylor – all big names in boxing,” he continued. “Boxing is one of the toughest sports when it comes to fitness. It’s got both of the energy systems, the aerobic system and the anaerobic system. I am really excited to be part of the Centra Live Well campaign, getting the people of Northern Ireland up on their feet and healthy. Your health is so important you have to look after yourself; you only get one body and one life,” Shane added. Commenting on the launch of Centra’s new brand repositioning and ‘Live Well’ campaign, Michael McCormack, Managing Director, Musgrave NI said: “Over the past few years, we have been on a journey of discovery with the Centra brand; we have taken the time to listen and learn from our customers and understand their needs. “Customers today don’t want convenience at any cost. Consumers are increasingly health conscious and as a convenience retail brand, we’re committed to helping our customers make better and healthier choices. This has been the driving force behind our store refresh programme, as well as the introduction of healthier product ranges across our stores. “Our new strapline is Live Every Day. It’s all about living in the moment and seizing the day. Our Live Well Ambassador programme which we launched today is a key part of this. 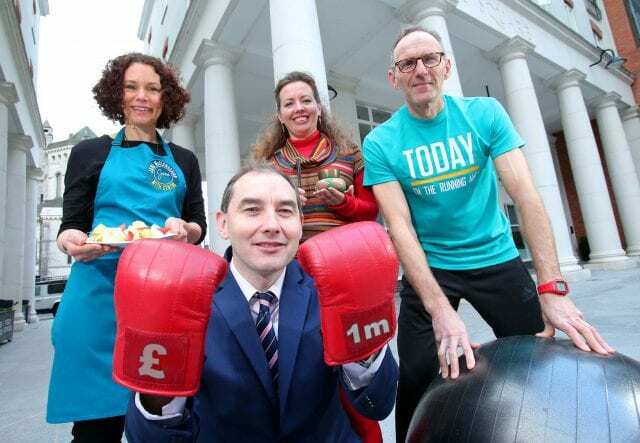 Centra and its team of ambassadors will lead Northern Ireland towards a healthy “mind, body & soul” through giving them the advice, knowledge and tools to help them make healthier choices, get active and achieve balance in their life,” he added. For further information about Centra’s Live Well campaign visit www.centra.co.uk or Like Centra NI’s Facebook page (facebook.com/CentraNI).